The National-Sozialistische Deutsche Arbeiterpartei Standarten Kalender is measured 6-1/2 x 10 inches and contains 105 pages. The calendar has chipboard backing that was made so that the calendar could be used with a easle back to stand on a desk or could be hung on the wall. 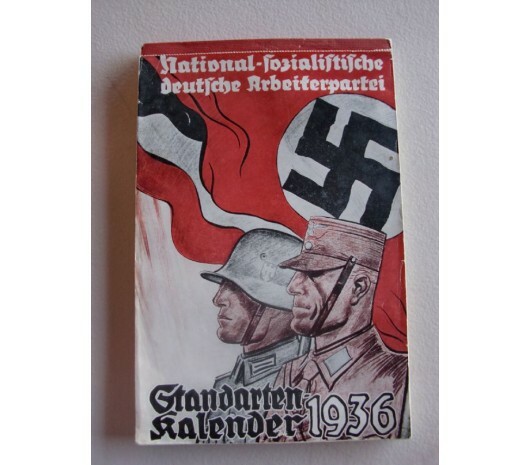 Each page has pictures or images on both sides, many of events, places, or famous people in Germany.This Third Reich calendar was published by the Central Publishing House of the Nazi Party, Franz Eher Nachfolger of München.Extremely rare to find, in almost perfect condition. The National-Sozialistische Deutsche Arbeiterpartei Standarten Kalender is measured 6-1/2 x 10 inches and contains 105 pages. The calendar has chipboard backing that was made so that the calendar could be used with a easle back to stand on a desk or could be hung on the wall. Each page has pictures or images on both sides, many of events, places, or famous people in Germany. 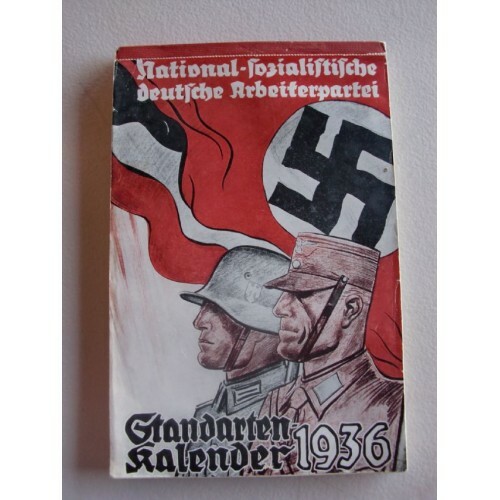 This Third Reich calendar was published by the Central Publishing House of the Nazi Party, Franz Eher Nachfolger of München. Extremely rare to find, in almost perfect condition.